DON’T VOTE BUT FIGHT AND RESIST! We, the only communist organization of Finland, are steadfast in the position that the elections and of the dictatorship of the bourgeoisie and voting in them are not only useless but even harmful things to the working class and the people. Instead of that, the blood red combat flag must be raised in defense and for the liberation of our class. In order to understand elections we must understand class struggle, for elections don’t take place in a vacuum but as a part of concrete class struggle. As a background, the development of class struggle on the international level must be kept in mind, of which the relevant has been said in the document of the V Meeting of the Marxist-Leninist-Maoist Parties and Organizations of Latin America “Thesis on the international situation and the tasks of the International Communist Movement” (2016). In Finland, as in many other countries, the bourgeoisie is already preparing for the next economic crisis. 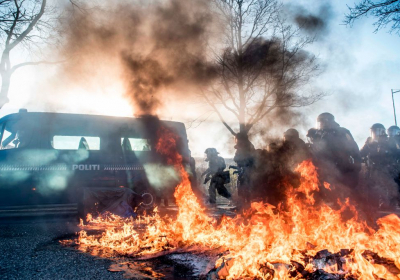 Many bourgeois sources also in Finland are already predicting it, and the working class knows well from its decades long experience that the crisis is coming – always it has come, and never has it declined from coming. Everybody remember the recession of the early 90’s and the finance crisis of 2008, and some remember even older events. Relying on undeniable historical facts, Marxism teaches that in capitalist society economic crises are inevitable and recurring, whereas in socialism they can be prevented through planning. The Sipilä government which started in 2015 in the aftermath of the last crisis, has become known for its harsh cuts politics which has been rationalized with fairy tales about common interests of Finns. Ostensibly, “blowing together into one coal”, “flexibility of all sides”, “competitiveness”, and ”preparing for bad years” are needed. Every proletarian in Finland knows that these are just aliases for taking from the working class and giving to the bourgeois. 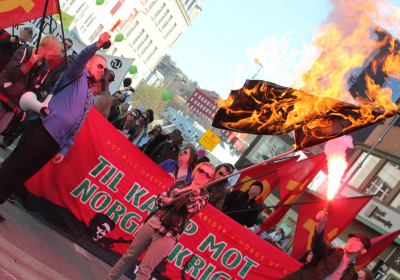 The so-called “left parties” of the bourgeois system try to ride the opposition to cuts politics, but they collide with no honest worker believing them, because the SDP and the Left Alliance have themselves been in previous governments making harsh cuts and have tried to present them as “defensive victories”. Well, there is also some truth in that – after all, weakening the status of the poor belongs inevitably to the bourgeois system. Those running dogs of the bourgeoisie accept cuts as “necessary evil” in a system that is otherwise so dear to them, and therefore won’t talk seriously anything about socialism and the dictatorship of the proletariat. For decades, strong corporativism has been a part of the Finnish bourgeois system, which is known by such names, among others, as “income politics” and “tripartism”. Corporativism is a method, originally made famous by Italian fascism, to crush and enslave the working class, and also in Finland its unfaltering support is found in the social-fascist “left parties”. This system has given certain material benefits to their most important support base, the “labour aristocracy”. The bourgeoisie, instead, especially its traditional liberal sections, have recently pushed for the crushing of corporativism, which is shown for example in the withdrawal of the EK (Confederation of Finnish Industries) from the centralized income politics as well as in the inclinations of the Sipilä’s government to bypass tripartism. The bourgeoisie does this to trample on the working class, the rights of which the yellow trade union movement defends to some extent. In short term the bourgeoisie may well gain the result its seeking, but on the long term the crushing of the corporativism will, instead, mean the rejoining of parts of the labour aristocracy back into the ranks of the proletariat which will increase the fighting force of the proletariat. Far from being stupid, the bourgeoisie knows well how dangerous it is to displace corporativism, and therefore it’s fomenting other forms of fascism. By dividing workers according to nationality and playing these against each other, the bourgeoisie hopes to make the workers to forget their contradiction with the bourgeoisie. In place of the characteristic class identity of workers, the bourgeoisie is pushing made-up reactionary national identity constructed, for example, around “Finnishness”, “Europeanness”, “Westernness”, “Christianity”, or ”secularism”. As a result of this, there has recently been an increasing number of various acts of vandalism against mosques, whereas not the first has been made at the place of the parliament. As one hobby-horse, fascists try to use the women’s cause – ostensibly Muslims are a threat to women. Even if there were not a single Muslim in Finland, there would still be a lot of violence and abuse against women as is known from statistics, and known is also the differences in wages between women and men, as is the accumulation of wageless home labour on the shoulders of women. In their delusional demagogic fantasies, fascists blame immigrants for everything which in reality the bourgeois must be accused – the bourgeois who polish their image with how many women are in the parliament, and trample on the majority of women in Finland and around the world deeper into misery. No way can this be accepted! Ideologically, the bourgeoisie tries to make the working class forget the fundamental truths of Marxism, which especially the experience of the year 1918 class war has indelibly stamped on it. 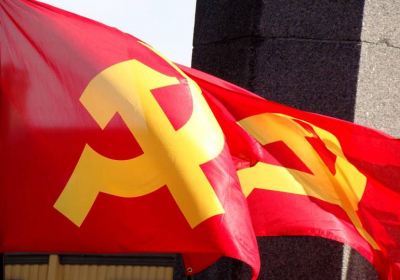 In the sphere of history it sows outright made-up lies about the workers’ first homeland, the Union of Soviet Socialist Republics, as well as about its leaders Great Lenin and comrade Stalin. Turning view into today – no matter which justified struggle of the working class is in question, be it for example cook’s strike or mass demonstration against forceful laws or the yellow vests of France or the rebels of Palestine, the bourgeoisie will by all means try to make believe that “it’s wrong to rebel”. In part as a result of the campaign of the bourgeoisie, which combines bribes and lies, but principally due to the decades long absence of the communist party in our country, a part of the working class has already been losing its faith in such fundamentals as Marxism, socialism, dictatorship of the proletariat, and the communist party. This can for a moment blur the thinking of the higher strata of the working class, but it can’t for long confuse the deepest and broadest strata of our class which has nothing to lose but their chains – those who are desperately seeking leaders for their justified rebellion. These deepest and broadest masses of the proletariat are already spontaneously positioning themselves against the system of the dictatorship of the bourgeoisie, of which the declining voter turnout is in part telling. Long behind are the peak years of the 60’s when both the social-democratic as well as the people’s democratic reformism still flourished and even 85% of the entitled to vote voted. Today only about 70% vote. For a long time the decline in voter turnout correlated with the decline of the “left parties”, but since then, being frightened at the weakening of the legitimacy of the bourgeois democracy with the decline of the voter turnout, the bourgeoisie has begun to use the so-called “right populism” or “extreme right”, principally the True Finns, and use scaremongering about its danger to prop up voter turnout. Nevertheless, from the long term trend of the voter turnout it’s observed that this most desperate attempt will be drained practically ineffectual. That is the context of class struggle in Finland, i.e. the common counter-revolutionary offensive of imperialism and revisionism, against which we must develop Marxist-Leninist-Maoist counter-offensive. In this purpose we must defend the sacred doctrine of our class, Marxism, today Marxism-Leninism-Maoism, from enemy attacks coming from all sides, and we defend it best by applying it in practice, because then we will simultaneously come to prove that Marxism is good for the proletariat and the people and bad for their enemies. The proletariat of Finland and us at its forefront must be ready to rebel, understanding it as justified and respond to the bourgeoisie in kind. Only this way we can defend what we already have when the bourgeoisie is trying to grab it, and only this way we can carry out struggle for the revolutionary renewal of the society to end all misery. The ballot is of no help at all, only organizing into struggle and into resistance is of use. The stance of Marxism-Leninism-Maoism is that in this day the general line of the international communist movement must be the boycott of reactionary elections, and in this issue our stance is completely the same as of Great Lenin, even though revisionists do try to present Lenin as a parliamentarian cretinist, by which word Lenin himself mocked the worshipers of the omnipotence of elections. Defending the boycott in 1905 Lenin referred to two things: 1) the question of choosing the road and 2) the developing revolutionary upsurge. For Lenin, choosing the road meant the revolutionary, proletarian road of the broad rebellious masses against the constitutional-monarchic road. In our case, on the other hand, it’s about choosing the proletarian road, in other words, today, the road of people’s war, against the “peaceful” road. Based on historical evidence, the “peaceful road” praised by revisionists doesn’t in reality lead to revolution, but its betrayal or even in the “best” case – to failure. This is our first Leninist argument for the boycott. The starting point of our second argument is that when the world revolution was in strategic defense, as it was during Lenin, boycotting elections couldn’t be set as a general line for the international communist movement, as is correctly explained by Lenin in his work “Infantile Disorder”. Whereas today, when the world revolution is in strategic offensive and the counter-revolution is in strategic withdrawal, it’s completely correct and imperative for us to set the boycotting of the elections of the bourgeoisie as a general line. Now, some wash-resistant revisionist will come and cry: “we must both vote and get organized, as you see it’s necessary to use all means!” Is it really so? Firstly, the issue has to be considered from the point of legitimizing the measures of the dictatorship of the bourgeoisie. As the parliament accepts laws one after another which weaken the status of the working class and the people and when it pushes the economic crisis for the poor masses to carry, it’s to the benefit of the struggling masses the fewer people have, by voting themselves, given approval to that parliament of the dictatorship of the bourgeoisie. Precisely for this reason the bourgeois are so worried about the declining voter turnout: the fewer give their approval to the system, the more insecure they’re doing their dark politics. Secondly, not a single revisionist brings up the question of the revolutionary transformation of the Finnish society, of moving from capitalism to socialism, from the dictatorship of the bourgeoisie to the dictatorship of the proletariat, and even less will revisionists do anything that will help in preparing the revolution. As they don’t want to revolutionize the world, but polish up certain details in it, they give their approval to the recurring economic crises and cuts politics, to fascism and the oppression of women, the tyranny of the bourgeoisie and the disenfranchised status of the working class, and in general everything that is an inseparable part of the capitalist reality. All struggle and resistance, as indispensable as we consider it, is only delaying battle and will go to waste unless they’re used to serve the struggle for power. In our case everything must serve the protracted work for the reconstitution of the Communist Party of Finland to initiate and lead people’s war, first to carry out the socialist revolution and the cultural revolutions continuing immediately after it all the way until communism. 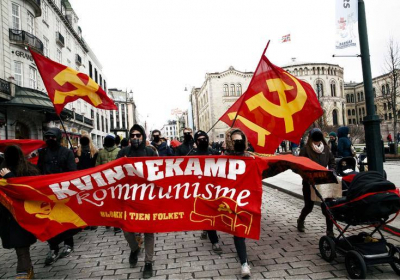 As it is, we Finnish communists, reaffirm the famous and magnificent slogan: “Elections no! People’s war yes!” This slogan shall sharpen into the minds of the proletariat of Finland its only road out of misery, even though it can’t yet immediately apply the people’s war. And is there some difference in relation to the EU elections? In it, the question presents itself even more clearly for also the working class, and the voter turnout in EU elections is notoriously about 40% time after time. We oppose the EU elections, because the EU is an imperialist project for the oppression of countries of the third world, countries that are no longer just overseas, but part is found even in Europe; the most famous being Greece but also certain so-called East-European countries. The are two great powers in the EU: German imperialism, which has economic power, and French imperialism, which has military power. Through its existence, the EU serves the superpower aspirations of these two countries. Finland is, naturally, of a different calibre, but an imperialist all the same, and EU has been beneficial for the advancement of Finnish imperialism economically, politically, militarily, as well as ideologically. Taking into account not only the general reasons, but also these specific reasons, it’s unconditional for us to boycott also the EU elections. 1. We must defend the proletariat’s only own ideology, today Marxism-Leninism-Maoism, and make known and before all transform into reality, apply its most revolutionary truths. 2. We must do persistent and all-round agitation and propaganda for the masses to prepare them for coming tribulations in short as well as in long term. 3. We must learn to organize struggle and resistance, because the poor masses need the organization of their rebellion also against the next government, and this indispensable struggle we must develop as service to the struggle for power which is the main thing because it leads the masses away from their current misery and disenfranchisement. 4. We must construct the united front of the proletarian revolution against the dictatorship of the bourgeoisie, especially against its elections and governments, applying Chairman Gonzalo’s principle of concentric construction and by leaning on the deepest and broadest masses. 5. And most of all: we must struggle for the reconstitution of the Communist Party of Finland, because the revolution needs a leader, as which only the Marxist-Leninist-Maoist party can act. Therefore we say to the bourgeoisie: let your blows rain, that will only tighten our ranks! With the poor masses we will welcome the next government of the dictatorship of the bourgeoisie – with raised fists. ELECTIONS NO! PEOPLE’S WAR YES!